^ 1.00 1.01 1.02 1.03 1.04 1.05 1.06 1.07 1.08 1.09 1.10 1.11 1.12 1.13 1.14 1.15 1.16 1.17 1.18 Williams, Dr. David R. Saturn Fact Sheet. NASA. September 7, 2006 [2007-07-31]. （原始内容存档于2011-08-21）. ^ McCartney, Gretchen; Wendel, JoAnna. Scientists Finally Know What Time It Is on Saturn. NASA. 18 January 2019 [18 January 2019]. ^ 9.0 9.1 Schmude, Richard W Junior. Wideband photoelectric magnitude measurements of Saturn in 2000. Georgia Journal of Science. 2001 [2007-10-14]. ^ 11.0 11.1 J.Hamilton, Calvin. Voyager Saturn Science Summary. Solarviews. 1997 [2007-07-05]. ^ Williams, Dr. David R. Jupiter Fact Sheet. NASA. November 16, 2004 [2007-08-02]. （原始内容存档于2011-10-05）. ^ Jupiter compared to Saturn. NASA. [2007-07-15]. （原始内容存档于2007-07-14）. ^ 16.0 16.1 16.2 16.3 Saturn. National Maritime Museum. [2007-07-06]. （原始内容存档于2011-10-06）. ^ Fortney, Jonathan J. Looking into the Giant Planets. Science. 2004, 305 (5689): 1414–1415 [2007-04-30]. PMID 15353790. doi:10.1126/science.1101352. ^ NASA - Saturn. NASA. 2004 [2007-07-27]. （原始内容存档于2011-08-21）. ^ Courtin, R.; Gautier, D.; Marten, A.; Bezard, B. The Composition of Saturn's Atmosphere at Temperate Northern Latitudes from Voyager IRIS spectra. Bulletin of the American Astronomical Society. 1967, 15: 831 [2007-02-04]. ^ Martinez, Carolina. Cassini Discovers Saturn's Dynamic Clouds Run Deep. NASA. September 5, 2005 [2007-04-29]. ^ Guillot, Tristan. Interiors of Giant Planets Inside and Outside the Solar System. Science. 1999, 286 (5437): 72–77 [2007-04-27]. PMID 10506563. doi:10.1126/science.286.5437.72. ^ S. Pérez-Hoyos, A. Sánchez-Lavega, R.G. Frenchb, J.F. Rojas. Saturn's cloud structure and temporal evolution from ten years of Hubble Space Telescope images (1994–2003) (PDF). 2005 [2007-07-24]. （原始内容 (PDF)存档于2007-08-08）. ^ Patrick Moore, ed., 1993 Yearbook of Astronomy,（London: W.W. Norton & Company, 1992）, Mark Kidger, "The 1990 Great White Spot of Saturn", pp. 176-215. ^ Watanabe, Susan. Saturn's Strange Hexagon. NASA. March 27, 2007 [2007-07-06]. ^ Warm Polar Vortex on Saturn. Merrillville Community Planetarium. 2007 [2007-07-25]. ^ Godfrey. 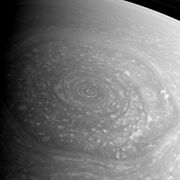 A hexagonal feature around Saturn's North Pole. Icarus. [2007-07-09]. ^ Sanchez-Lavega, A. Ground-based observations of Saturn's north polar SPOT and hexagon. Bulletin of the American Astronomical Society. [2007-07-30]. ^ NASA catalog page for image PIA09187. NASA Planetary Photojournal. [2007-05-23]. ^ NASA Sees into the Eye of a Monster Storm on Saturn. NASA. November 9, 2006 [2013-02-24]. ^ 33.0 33.1 Russell, C. T.; Luhmann, J. G. Saturn: Magnetic Field and Magnetosphere. UCLA - IGPP Space Physics Center. 1997 [2007-04-29]. ^ 34.0 34.1 McDermott, Matthew. Saturn: Atmosphere and Magnetosphere. Thinkquest Internet Challenge. 2000 [2007-07-15]. （原始内容存档于2011-10-05）. ^ J.D. Anderson and G. Schubert. Saturn's gravitational field, internal rotation, and interior structure. Science. 2007, 317: 1384–1387. PMID 17823351. doi:10.1126/science.1144835. ^ Joe Rao. NightSky Friday: See Saturn closest to Earth in 30 Years. space.com. 2003 [2007-07-28]. （原始内容存档于2008-05-11）. ^ 42.0 42.1 Baalke, Ron. Historical Background of Saturn's Rings. Saturn Ring Plane Crossings of 1995-1996. Jet Propulsion Laboratory. [2007-05-23]. （原始内容存档于2009-03-21）. ^ Saturn's Cassini Division. StarChild. [2007-07-06]. ^ James Clerk Maxwell on the nature of Saturn's rings. JOC/EFR. March 2006 [2007-07-08]. ^ Poulet F.; Cuzzi J.N. The Composition of Saturn's Rings. NASA Ames Research Center. 2002 [2007-07-28]. （原始内容存档于2007-09-30）. ^ Shafiq, Muhammad. Dusty Plasma Response to a Moving Test Change (PDF). 2005 [2007-07-25]. （原始内容 (PDF)存档于2012-03-06）. ^ Rincon, Paul. Saturn rings have own atmosphere. British Broadcasting Corporation. July 1, 2005 [2007-07-06]. ^ Johnson, R. E. The Enceladus and OH Tori at Saturn. The American Astronomical Society. 2006 [2007-07-07]. ^ 50.0 50.1 Schmude, Richard W Jr. SATURN IN 2002-03. Georgia Journal of Science. 2003 [2007-10-14]. （原始内容存档于2013-01-12）. ^ The Journal of the British Astronomical Association. British Astronomical Association. 2003年2月 [2007-07-07]. （原始内容存档于2007-09-28）. ^ The Alphabet Soup of Saturn's Rings. The Planetary Society. 2007 [2007-07-24]. （原始内容存档于2010-12-13）. ^ Hamilton, Calvin. Saturn's Magnificent Rings. 2004 [2007-07-25]. ^ Malik, Tarig. Cassini Probe Spies Spokes in Saturn's Rings. Imaginova Corp. 2005-09-15 [2007-07-06]. ^ Saturn's Known Satellites. [2007-05-23]. （原始内容存档于2003-07-07）. ^ Serge Brunier. Solar System Voyage. Cambridge University Press. 2005: 164. ^ Saturn > Observing Saturn. National Maritime Museum. [2007-07-06]. （原始内容存档于2007-04-22）. ^ 61.0 61.1 61.2 Starry Night Times. Imaginova Corp. 2006 [2007-07-05]. ^ James Evans. The History and Practice of Ancient Astronomy. Oxford University Press. 1998: 296–7. ^ Eastman, Jack. Saturn in Binoculars. The Denver Astronomical Society. 1998 [2008-09-03]. ^ Chan, Gary. Saturn: History Timeline. 2000 [2007-07-16]. （原始内容存档于2011-08-21）. ^ Micek, Catherine. 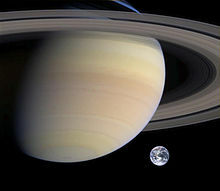 Saturn: History of Discoveries. [2007-07-15]. （原始内容存档于2011-08-21）. ^ The Pioneer 10 & 11 Spacecraft. Mission Descriptions. [2007-07-05]. （原始内容存档于2006-01-30）. ^ 67.0 67.1 Missions to Saturn. The Planetary Society. 2007 [2007-07-24]. ^ Astronomers Find Giant Lightning Storm At Saturn. ScienceDaily LLC. 2007 [2007-07-27]. ^ Probe reveals seas on Saturn moon. BBC. March 14, 2007 [2007-09-26]. ^ Rincon, Paul. Huge 'hurricane' rages on Saturn. BBC. November 10, 2006 [2007-07-12]. ^ NASA Probe Gets Close Views of Large Saturn Hurricane. NASA. April 29, 2013 [2019-01-14]. ^ Brown, Dwayne; Cantillo, Laurie; Dyches, Preston. NASA's Cassini Spacecraft Ends Its Historic Exploration of Saturn. NASA. 15 September 2017 [15 September 2017]. ^ Chang, Kenneth. Cassini Vanishes Into Saturn, Its Mission Celebrated and Mourned. The New York Times. 14 September 2017 [15 September 2017]. Lovett, L.; Horvath, J.; Cuzzi, J. Saturn: A New View. New York: Harry N. Abrams, Inc. 2006. ISBN 0810930900.